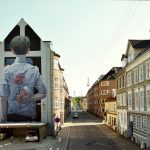 Initiative Karakallio Creative, curated by Upeart enlivens the Karakallio suburb, in the city of Espoo, with art and events, aimed to increase the vitality of the area and arouse a positive interest in public art. Karakallio is a beautiful residential area surrounded by nature, with 5500 inhabitants. The first artist to be invited to Karakallio was by Teemu Mäenpää. Mäenpää Teemu stayed for a week before he painted so he could get to know the residents and absorb the atmosphere of the area. Teemu Mäenpää painted an elderly couple who had been the first residents of the building where the mural was to be painted. The couple still live together in the very same building. The mural signified long lasting love. Check back next year when artist Pastel is invited to paint in this special suburb.